The big V8s proving a handful in the wet in the Australian Touring Car Masters Championships at Winton Raceway in Victoria. (1/2) #88 Tony Karanfilovski gets the 1969 Ford Mustang Trans Am re-pointed to head down the back straight. 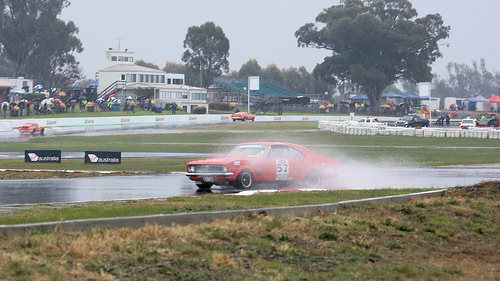 (2/2) # 57 Graham Alexander in his Holden HT Monaro GTS ploughing through the buildup.